Anterior hip replacement offers a number of benefits over other types or hip surgery. 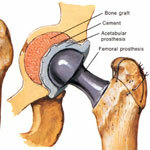 Anterior hip replacement allows the surgeon to access the hip from the front of the body rather than the side. This has the advantage of replacing the hip without having to detach or traumatize the surrounding muscles. The hospital stay for conventional hip surgery is 3 to 19 days, but with anterior hip replacement surgery it is only 2 to 4 days. The incision is several inches shorter than in conventional surgery. With conventional surgery, the patient must restrict certain movements that involve the hip for 6 to 8 weeks after surgery. With anterior hip replacement surgery, the patient is usually able to go up and down stairs before even leaving the hospital. One of the reasons for the faster recovery is that unlike conventional surgery, the muscles are not detached from the bones. Of course, the ultimate benefits are relief from pain, restoration of mobility, and in some cases, independence. There are risks involved in any hip replacement surgery. Your individual level of risk depends on your overall health and the skill of your surgeon. Hip resurfacing is done to create a new surface for both parts of the joint. People with osteoporosis may have difficulty with the joint becoming loose later on. Other risks include infection in the joint or at the wound site, blood clots, injury to nerves, difficulty healing, a difference in the length of the legs, and rarely, hip dislocation. In addition, the recent Zimmer hip replacement recall and the Depuy hip replacement recall are reminders that artificial joints can have defects and need replacement. If you are considering hip replacement surgery, take the time to learn all you can. The best orthopedic surgeons will be willing to take the time to explain all of your options and answer your questions.